The Magna Carta is stored in the glass case in the Cathedral’s Chapter House. The copy at Salisbury Cathedral is the best-preserved of four surviving copies of the Magna Carta. A man smashed the glass, trying to steal the document, but alarm was activated, the Art Newspaper reports. Visitors of the cathedral were evacuated, police were informed. Despite photographs of the broken glass on the internet, the Cathedral officially said it was “undamaged”. It appears that traces on the glass box were caused by a hammer or a similar object. Police arrested a 45-year-old man based on evidence of evidence. The man was arrested on suspicion of attempted theft, possession of an offensive weapon and criminal damage. He was taken to a police station for questioning. 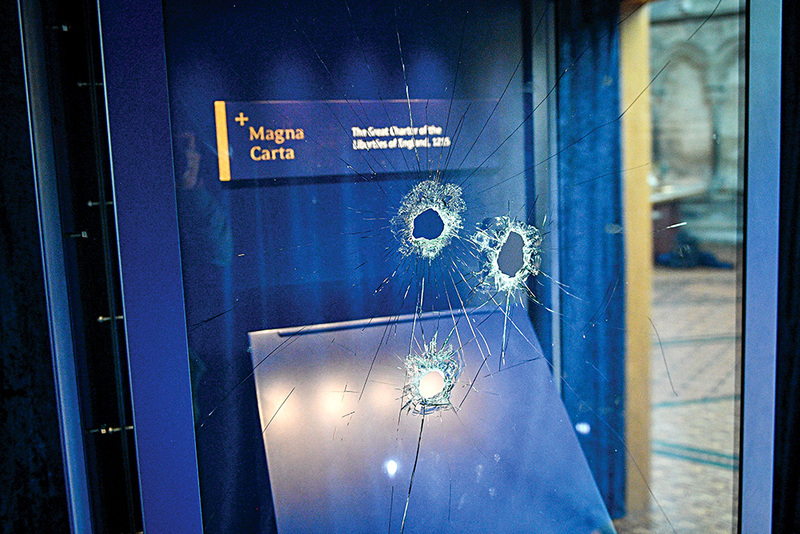 The Magna Carta exhibition is temporarily closed. The Cathedral says its aim was “to reopen as soon as possible”. Dating back to 2015, the Magna Carta is an important artifact for the history of English literature, democracy and law. Four copies have survived. One is stored at Salisbury Cathedral, another one is at Lincoln Cathedral and two others are owned by the British Library.